Sony UP-CR10L SnapLab printer/ UPCR10L SnapLab Mini Kiosk - PFS / Photo Finishers Supplies Inc. The Sony UP-CR10L Digital Photo Printer, the "Snap Lab" ia A stylish and undersized stand alone professional photo-finishing solution. This digital photo printer is packed with a host of robust features in a highly compact body. Utilizing Sony dye sublimation technology, the "Snap Lab" can produce photo-lab-quality prints in just a few seconds. The Snap Lab Digital Photo System prints 3.5 X 5", 4 X 6", 5 x 7" and 4"x8" photo quality prints. In addition, its 8-inch color LCD (viewable area measured diagonally) and user-friendly Graphical User Interface (GUI) will help you to print memorable and creative photos easily. The LCD screen allows the user to edit photos, add borders, add text and print split images. We all know the demand for digital photo printing is expanding rapidly, and the "Snap Lab" offers an affordable and exciting opportunity to enter the new digital photo market. Its attractive features will enhance customer satisfaction, making it the ideal choice for countless on-location applications. The UPCR10L Snap Lab accepts all current digital media types. Designed to fit almost anywhere and easily transportable, the SnapLab Digital Photo-finishing system has a compact body, small footprint and weighs only 24 pounds. With the user-friendly Graphical User Interface (GUI), it's easy to use and operate the SnapLab Digital Photo-finishing system. Simply insert digital media and touch the buttons on the LCD panel to edit and print images. Tilt the angle of the 8" LCD panel to operate the SnapLab Digital Photo-finishing system from a variety of viewing positions. With the panel's touch-sensitive capability, you can edit photos, add borders and insert text on-location without the use of a PC. Although you can use the SnapLab Digital Photo-finishing system without a PC, you can also edit digital images on your computer and transfer them to the SnapLab system via the supplied printer driver (supports Microsoft� Windows 2000, XP Home Edition and XP Professional). For protection against theft, the SnapLab Digital Photo-finishing system comes equipped with a security slot for attaching a security cable. Replacing paper and ribbon is very simple and doesn't require chemicals or any special skills. The Sony SnapLab Digital Photo-finishing system accepts a wide variety of digital media including Memory Stick� media, Memory Stick Duo media, Memory Stick PRO media, Memory Stick Pro Duo media, Secure Digital (SD) card, Multi Media card, Smart Media card, xD-Picture card, and CompactFlash� (CF) card, and microdrives. For photo-lab-quality digital prints, the SnapLab Digital Photo-finishing system features Sony's dye sublimation technology. Instead of printing dots of ink, dye sublimation printers lay down colors in continuous tones one color at a time. The result is crisp, vibrant images with natural, continuous tones. Share photos instantly. A newly developed thermal print mechanism enables the SnapLab Digital Photo-finishing system to operate at high speeds, regardless of print size. In just seconds you can create borderless prints and index prints in multiple sizes. Print a 3.5" x 5" photograph in 13 seconds, a 4" x 6" photograph in 16 seconds and a 5" x 7" photograph in 17 seconds. The SnapLab system also features a fast 10-second startup time, so you can power on and start printing images right away. An industry first in instant digital photo printing, Sony’s ProMatte and glossy prints can be produced on the Sony UPCRl0L SnapLab by using the same print pack. The different finishes are produced using Sony’s unique lamination technology so there’s no need to change paper to achieve this unique look. With the SnapLab Digital Photo-finishing system, you have a complete set of editing tools to enhance and customize your photographs. Zoom, crop and rotate the focus on a subject. Eliminate unwanted background and rotate the image. Adjust the color for maximum vibrancy. Reduce unwanted red-eye. Transform color pictures into black and white or sepia-toned images. Overlay your company logos, event names, or custom-designed borders onto your digital images. It's easy to create cards for events and announcements. Easily identify an event or personalize a photograph by placing messages and captions on images and borders. Border designs can be created utilizing Adobe® Photoshop® and supplied plugin. Easily keep track of orders. Using Sony's original pattern lamination technology, you can print numbers on the front of the photograph that are only visible when the print is tilted. By printing order numbers on each photo, prints can be sorted by job for smooth distribution. In addition, a print log can be viewed on the LCD panel and exported to a CompactFlash� card or microdrive in "CSV" format for use as a Microsoft� Excel file on your computer. 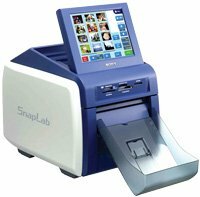 Add value to each print and create anything from ID cards to novelty products using 30 built-in templates within the SnapLab system. After requesting a print order, the SnapLab Digital Photo-finishing system spools the image data to be printed. Remove the memory card and continue to take more photographs while the job is printing. Screensaver images can be customized by preloading data. The screen can display various images such as a company logo or a special promotion when the printer is not printing digital photos. 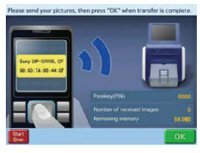 The SnapLab can receive and then print images from Bluetooth devices such as camera phones. Images are transferred wirelessly via Bluetooth and then stored in a buffer memory where they can be edited and printed in the normal way. (Requires USB Bluetooth adaptor DPPA-BT1 and a CompactFlash or MicroDrive card, sold separately). 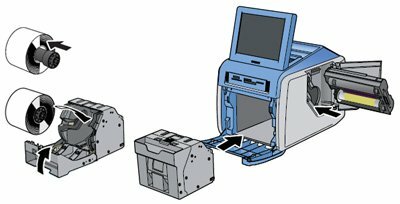 Job tickets can be printed either on thermal paper utilizing an Epson TM88III/IV receipt printer or directly on the photo paper** used in the Sony UPCR10L SnapLab printer. This feature allows the customer to bring up the printed job ticket to the cashier for order payment. The barcode can be included on the job ticket via special files in the expansion Compact Flash. Setting band pricing is easy on the Sony UPCR10L SnapLab printer, owners can vary the price per print based on the number of prints ordered. This allows volume discounts for large orders.